Call it a mixed message. A so-called non-dumping site on the southend has become a dumping site for the city. 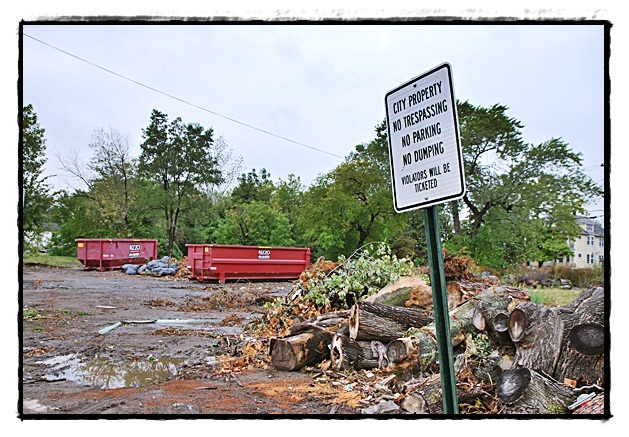 Behind those ominous signs, however, is an open lot with piles of tree limbs and other debris along with two giant dumpsters. Martin Ladd, the Director of Public Services, concedes it’s a confusing message, but he stressed that it is city property and the city can do what it wants to do there. And that site has become a dumping ground for the city until another site that can’t be seen from the street is found. “I’m limited in land right now,” Martin said. Martin said because the site is so accessible, “folks have come down to use it.” However, he warned, anyone caught dumping there will be ticketed. The site will likely undergo a cleanup in the coming months because Hanley International Academy plans to build a new school down the street at the former state Department of Human Services building. “With the school coming we need to find a new location,” Ladd said.